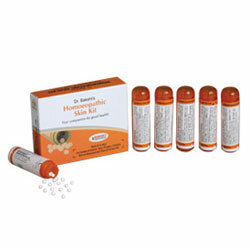 Bakson's Homoeopathic Skin Kit Treats Eczema & Rashes, Acne/Pimples, Urtica, Dandruff & Hair Fall, Boils & Abscesses. Your Companion for good health!. For rashes, itching eruptions, dry, rough and scaly skin. Checks falling, thinning & premature graying of hair and controls Dandruff. Clears impurities (toxins) of the blood thereby relieving Boils, Abscesses, pimples, Styes, Eczema. Adults : Dissolve 4 globules in the mouth 4 times a day. Children : 3 pills, 3 times a day. In acute/severe cases : 4 pills every 2 hours, 6-8 times a day, may be taken.